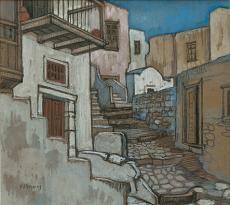 Landscape prevailed in Greek painting in the first two decades of the 20th century. It was mainly in this field that innovative artistic trends were expressed during this period. Established in Athens in 1917, the ‘Techni’ [Art] group of artists brought together groundbreaking artists who aspired to create a Greek Modernism. 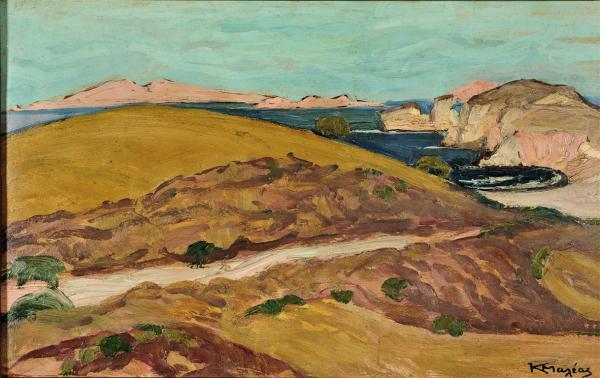 Konstantinos Maleas and Nikos Lytras were amongst them.A founding member of the group, Maleas painted Mount Taygetus in 1920, by which time his style had fully evolved under the influence of the Post-Impressionist movements and Paul Cézanne. 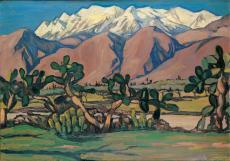 Having long returned to Greece from Paris, where he studied, he was almost exclusively preoccupied with landscape subjects from 1917 to 1920.The view of the mountain landscape of Sparta – the snowy mountain masses in the background, the bare slopes in purple shades, the groups of prickly pears below and the green bands in the middle- and foreground – is painted in vivid, lustrous colours and clearly legible brushwork that allows us to trace the movement of the brush. The contoured forms, the schematisation, the perspective-abolishing flatness, the high horizon, the rhythmical arrangement of space in successive horizontal bands – all of these elements, which are present in this painting in the A. G. Leventis Gallery, are characteristic of Maleas’ production in general.